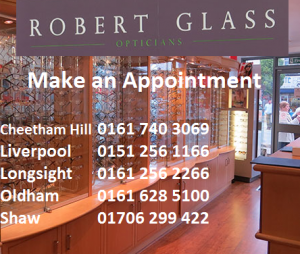 Robert Glass Opticians is an independent group of five practices founded in Manchester in 1989. All are based at the heart of their local communities in Greater Manchester and Liverpool. At Robert Glass Opticians, our aim is simple – we want you to look forward to coming to see us, to know that you will be well cared for while you are with us and to feel that you can trust us with the importance of you and your family’s eye health. We have built a strong reputation for the quality of our professional expertise and service. We understand the needs of our patients and aim to deliver the level of service they expect to receive. We know that if we want to provide you with the best possible eye care we need to keep up to date with the latest optometrical techniques and technology, naturally we do all of that. Our optometrists are highly skilled and have additional accreditation in screening for Diabetic Retinopathy, Glaucoma, Red Eye, Ocular Hypertension and Cataracts. We also offer a Low Vision Service and Coloured overlay assessments for those patients with specific learning difficulties. From fashion to function, trend to traditional, your glasses are as personal as you make them. Our trained dispensing staff are here to help you choose from over 700 frames and to recommend the best lens options to meet your needs. For any age, for any budget we are sure to find a frame or contact lenses suited to you.